Microsoft’s upcoming console upgrade, Project Scorpio, promises to be the “most powerful console ever built.” And according to the folks at Digital Foundry, the console can go toe-to-toe with some of the most popular contemporary PC hardware. Digital Foundry today posted its exhaustive first-impressions piece of Project Scorpio’s hardware, detailing the console’s specs and computing capabilities. 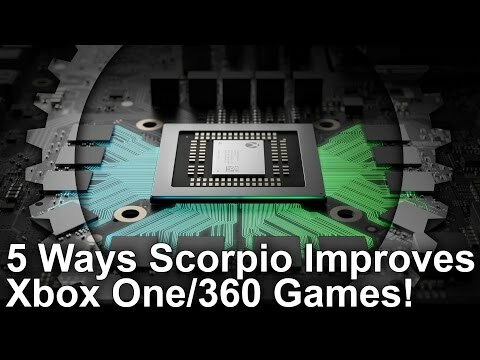 According to the analysis, Scorpio’s heavily boasted six teraflops “will almost certainly go a lot further than an equivalent PC part. Firstly, [Microsoft claims] that their shader compiler is far more efficient than PC equivalents (think of shaders as native GPU code). Secondly, addressing the hardware directly via their API and with access to console-specific GPU extensions again adds to the advantage of a fixed platform box. And finally, they point to their optimisation software – PIX (Performance Inspector for Xbox) – as a tool that provides the path to console-specific optimisations that PC simply cannot get. This all means that, according to Microsoft, Scorpio’s graphics hardware will deliver better performance rendering 4K visuals than an equivalent PC GPU. Digital Foundry’s Richard Leadbetter compares the hardware in question to the likes of NVIDIA’s GTX 1070 and AMD’s RX 470. Based on the numbers, Project Scorpio will indeed be the most powerful gaming console ever built. After failing to keep up with Sony in sales since the 2013 launch of both the Xbox One and the technically superior PS4, Microsoft’s power play is certainly a good look for this universal mid-generation upgrade. However, the Scorpio will need to do more than pushing the technological envelope if Microsoft hopes to overtake Sony in the console space. Leadbetter’s exclusive look at the Scorpio’s impressive guts leads him to conclude that it will most likely ship at a premium price-point. “If I had to guess,” he states noncommittally, “Project Scorpio is going to cost in the region of $499.” In contrast, the PS4 Pro—Sony’s equivalent high-performance tier console—currently goes for $399. This wouldn’t necessarily be a death signing for Microsoft’s next console, but at such a high price-point in comparison to its direct competitor, Project Scorpio would have to do more than just outplay the PS4 Pro in technological performance. Also, it’s worth noting that the last time an Xbox shipped at a 25% higher cost than a PlayStation, the latter went on to crush the competition. Project Scorpio is expected to launch Q4 of this year. We’ll certainly hear more about the console come E3 this June. One of the longest running independent gaming news, reviews and culture sites on the web.